The emerging world's rapid economic and population growth has created extreme solid waste accumulation, overwhelming cities' ability to deal with sustainable waste management. According to the World Bank, approximately half the urban solid waste in developing countries remains uncollected, and less than 50 percent of the population is served. The impact on the environment and on public health is significant, especially since open waste dumps remain the dominant form of processing in the Global South. The following approaches describe four waste management solutions that are making a difference in Nairobi, Mumbai, Mexico City and Rio de Janeiro. Read on to learn more, and then join the conversation on URB.im. The Mukuru Recycling Centre is based in a Nairobi informal settlement that borders an important dumpsite. The Centre is composed of waste-pickers whose livelihoods are all inextricably connected to the nearby dumpsite. The organization not only creates economic opportunities for the residents, but also helps in the rehabilitation of scavengers who, having spent their entire lives working knee-deep in garbage, have little sense of self-worth or prospects for a better future. The Centre has cut out the middleman and transports the collected plastic, metal and glass directly to the big recycling plants. The group has also set up a system to transform used paper and cardboard into coal-substitute briquettes and a compost unit for organic waste, which the waste-pickers use themselves and also sell on to other groups involved in urban agriculture. 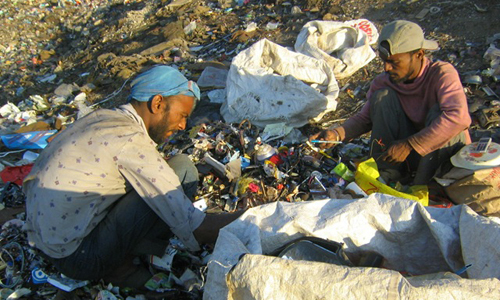 By belonging to a community, the waste-pickers support each other in their struggle to get out of the cycle of despair. As a result of Mumbai's lack of waste management infrastructure, a large, informal rag-picking and recycling industry has grown among the urban poor. The ACORN Foundation works to improve conditions for the city's garbage pickers -- many of whom earn less than a dollar a day for their strenuous work. The project refers to waste collectors not as rag-pickers, but as "green workers," recognizing their progressive role in a worldwide recycling movement. The organization has 400 workers engaged in its project and currently focuses on providing informal schooling to their children in an effort to keep them from engaging in the trade at an early age. Because handling garbage is a significant health risk, ACORN also organizes health programs and regular check-ups. Most importantly, ACORN is working to bring official recognition to these "green workers." It helps them get ration cards, thus providing them with an identity -- an important step towards recognition. 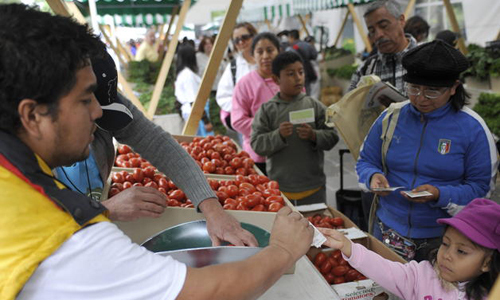 Mexico City's "barter market" is an innovative exchange system that seeks to handle the massive amount of waste generated daily in the city. Residents flock to "green points," where they can buy local products in exchange for collected waste. The collection follows a detailed valuation and exchange equivalency program: inorganic waste like glass, paper and aluminum, can be traded in for food such as vegetables, cheese and plants. This approach minimizes the impact of pollution, encourages citizens to take responsibility in waste management and helps keep food prices low. Sitiê is an initiative working to transform Rio de Janeiro's Vidigal, a low-income neighborhood with 9,000 residents. Three local residents decided to recover a 300-square meter former garbage dump and transform it into a park. They first engaged other community members to help them clear away trash, then planted new trees. They hired local artists to help them decorate the park, using mostly recycled materials retrieved from the garbage dump -- old toilets are now vases for plants and flowers, and old tires are used as part of the trail leading into the park. The result is a "green oasis," as many locals are calling it, right in the heart of the city. Most impressively, this initiative is based entirely on neighborhood support and collaboration. These four solutions, all involving grassroots efforts and community building, are important initiatives contributing to resolving the environmental issues afflicting the Global South. Join us on URB.im to read more and to join the conversation.